Head and neck cancer is a general term that covers many different types of cancers. These include nasal and paranasal sinus cancer, mouth and oropharyngeal cancer (incl. tonsil cancer), laryngeal cancer, salivary gland cancer, nasopharyngeal cancer and throat cancer. Cancer can start in the lining of the space behind the nose (nasal cavity) or in the small, air filled spaces within the bones close to the nasal cavity (paranasal sinuses). 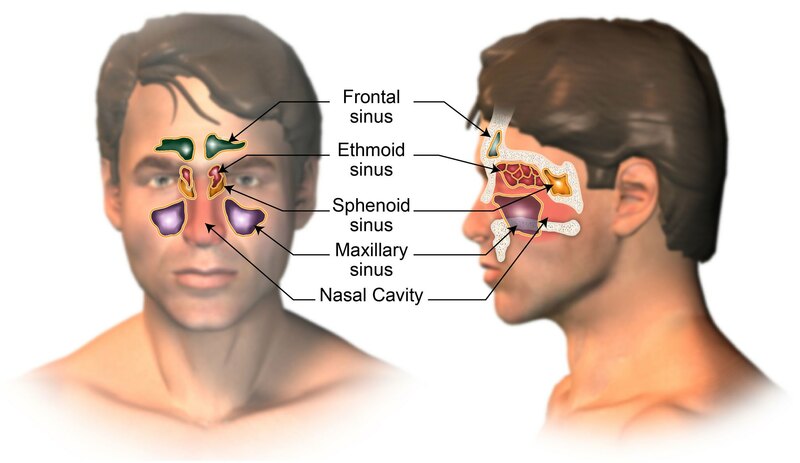 Cancer of the nasal cavity and sinuses is rare with only around 440 cases diagnosed in the UK each year. Several layers of tissue make up each part of the cavity and sinuses and each layer contains many different types of cells. Different cancers can develop from each type of cell. Squamous cell carcinoma (SCC) is the most common types with 60% of nasal cavity and paranasal sinus cancer being SCCs. Other types include adenocarcinomas, adenoid cystic cancers, lymphoma, plasmacystomas, melanomas, olfactory neuroblastomas and sarcomas. Surgery is a common treatment for these tumours. Radiotherapy can also be used. Chemotherapy can be given alongside surgery or radiotherapy. There are no UK wide statistics for these cancers. The following statistics are from a large European study. For people diagnosed with nasal cavity or paranasal sinus cancer in the UK more than 70% will survive their cancer for 1 year or more and around 50% will survive their cancer for 5 years or more after their diagnosis. Mouth cancer can start in the lips, gums or soft sides of the mouth. The oropharynx is the part of the throat (pharynx) just behind the mouth. Cancer starting in the oropharynx is called oropharyngeal cancer. Around 4000 new cases of mouth and oropharyngeal cancer are diagnosed in the UK every year. It is more common in men than women. More than 90% of mouth and oropharyngeal cancers are squamous call carcinomas (SCC). Other types include salivary gland cancer (adenocarcinomas), adenoid cystic tumour, lymphoma and melanoma. The main treatments are surgery, radiotherapy, chemotherapy, radiotherapy and biological therapy. They may have one type of treatment or a combination of treatments. There are no UK-wide statistics for these cancers. The following statistic is for people in England diagnosed between 2009 and 2013. For mouth cancer almost 80% survive their cancer for 1 year or more and almost 60% survive their cancer for 5 years or more after diagnosis. For oropharyngeal cancer almost 85% survive their cancer for 1 year or more and around 65% survive their cancer for 5 years or more. For tongue cancer, around 80% survive their cancer for a year or more and around 60% survive their cancer for 5 years or more. Laryngeal cancer is a rare cancer that starts in the larynx (voice box). There are three main parts of the larynx; supraglotis, glottis and subglottis and cancer can deleop in any or all of these parts. Around 2400 people are diagnosed in the UK each year with laryngeal cancer and is more common in men than women. More than 90% of laryngeal tumours are squamous cell cancers (SCC). Other types include adenocarcinoma, sarcomas, chondrosarcomas (in the cartilage that supports the larynx), lymphoma and plasmacytoma (type of melanoma). Patients may have one or more of the following treatments; surgery, radiotherapy, chemotherapy and biological therapy. There are only survival statistics in men because so few women are diagnosed with this cancer. Generally for men with cancer of the larynx in England and Wales, aroun 85% will survive 1 year or more, around 65% will survive their cancer for 5 years or more and around 55% will survive their cancer for 10 years or more after diagnosis. Salivary gland cancer can start in any of the glands that produce saliva. There are 3 major pairs of salivary glands and over 600 smaller, minor salivary glands throughout the lining of the mouth and throat. 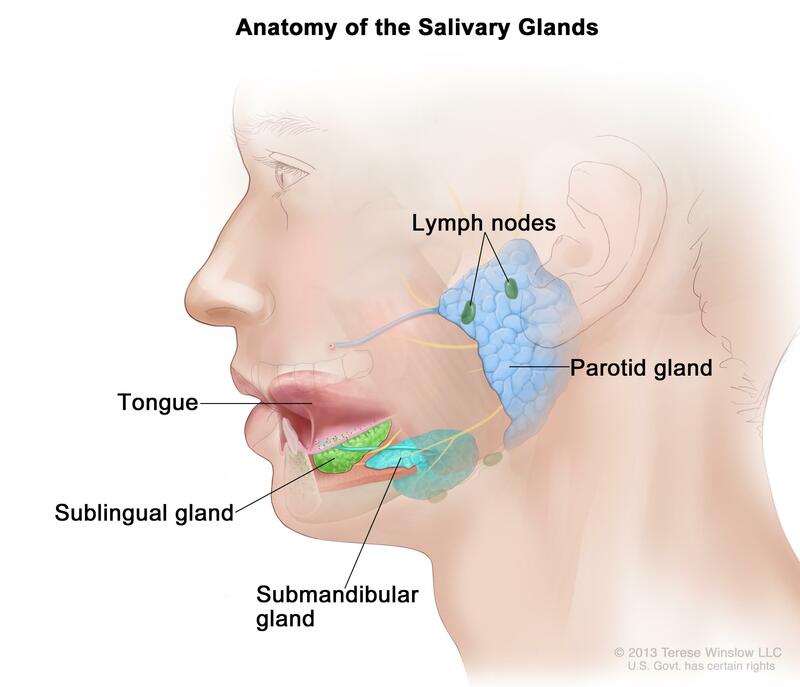 The 3 major pairs of salivary glands are the parotid glands, sublingual glands and submandibular glands. Most salivary gland cancers start in the parotid glands with around 80% starting there. Salivary gland cancer is a rare cancer with around 720 people diagnosed in the UK each year. It is slightly more common in men than women. Most tumours of the salivary gland are not cancer and are called benign tumours (approximately 75% are benign). The type of cancer is named after the type of cell the cancer started in. The main tupes include mucoepidermoid cancer, acini cell carcinoma, adenoid cystic cancers, adenocarcinoma, malignant mixed cancers and low grade polymorphous cancers. Treatment depends on which gland the cancer started in. The main treatments for salivary gland cancer are surgery, radiotherapy and chemotherapy. They may have one of these or a combination. There are no UK-wide statistics available for salivary gland cancer survival in the UK. Overall, for all people with this cancer in the UK, around 70% will survive their cancer for 5 or more years after they are diagnosed. 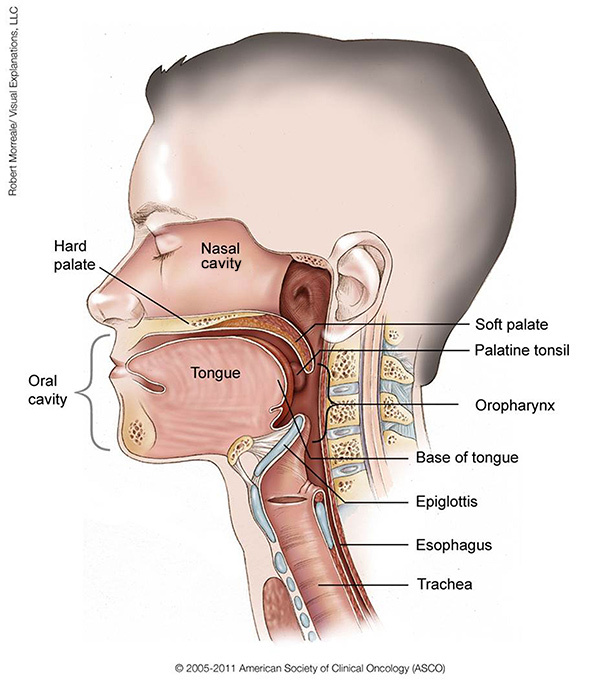 Nasopharyngeal cancer is a cancer that begins in the middle part of the throat called the nasopharynx. It is a rare cancer in the UK with only around 240 cases diagnosed each year. It is more common in men than women. 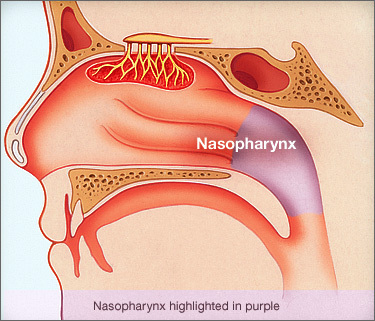 Several laers of tissue make up the nasopharynx and each layer contains many different cell types. Different types of cancer develop from each type of cell. The main type is squamous cell carcinomas (SCC) and there are three main types of these; keratinising SCC, non keratinising SCC and undiferentiated carcinomas. Other types of nasopharyngeal cancers are adenocarcinomas, adenoid cystic carcinomas, lymphomas, melanomas and sarcomas. treatment depends on the stage and type of nasopharyngeal cancer. Radiotherapy is the main treatment and can be used alone or with chemotherapy (chemoradiotherapy). Surgery is not often used. There are no UK wide statistics for nasopharyngeal cancer survival. For all people diagnosed with this cancer in England, almost 80% will survive their cancer for 1 year or more and around 50% will survive their cancer for 5 years or more after they are diagnosed. 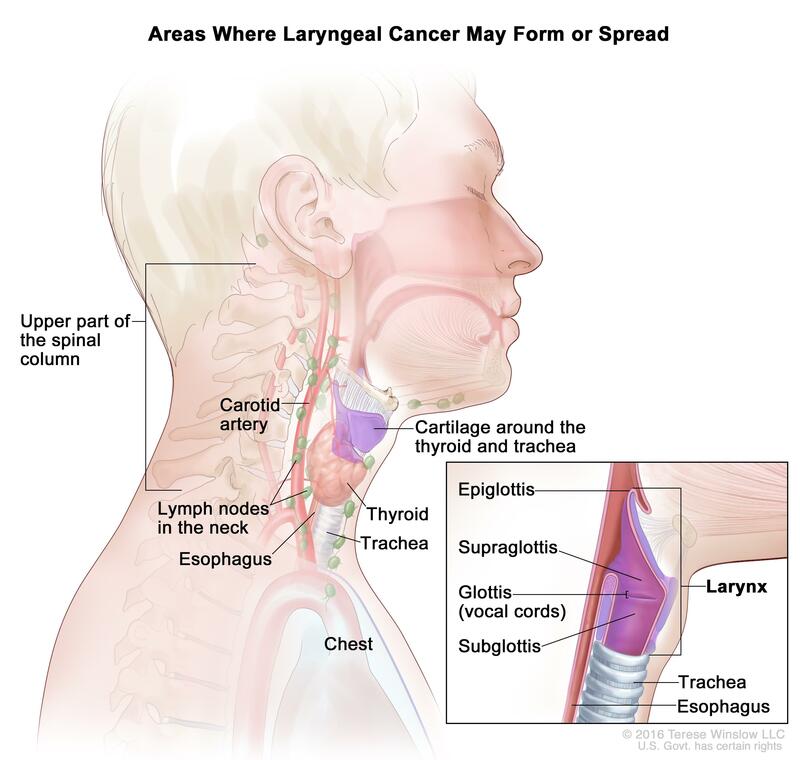 Throat cancer can mean cancer that starts in any of the different structures and areas within the throat (pharynx). The 3 main parts of the pharynx are the nasopharynx, oropharynx and hypopharynx. 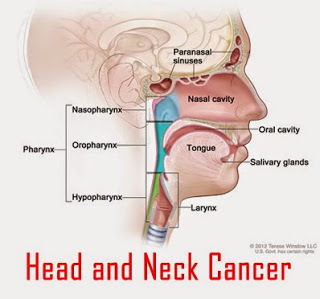 For nasopharynx and oropharynx tumours see nasopharyngeal cancer and oropharyngeal cancer. 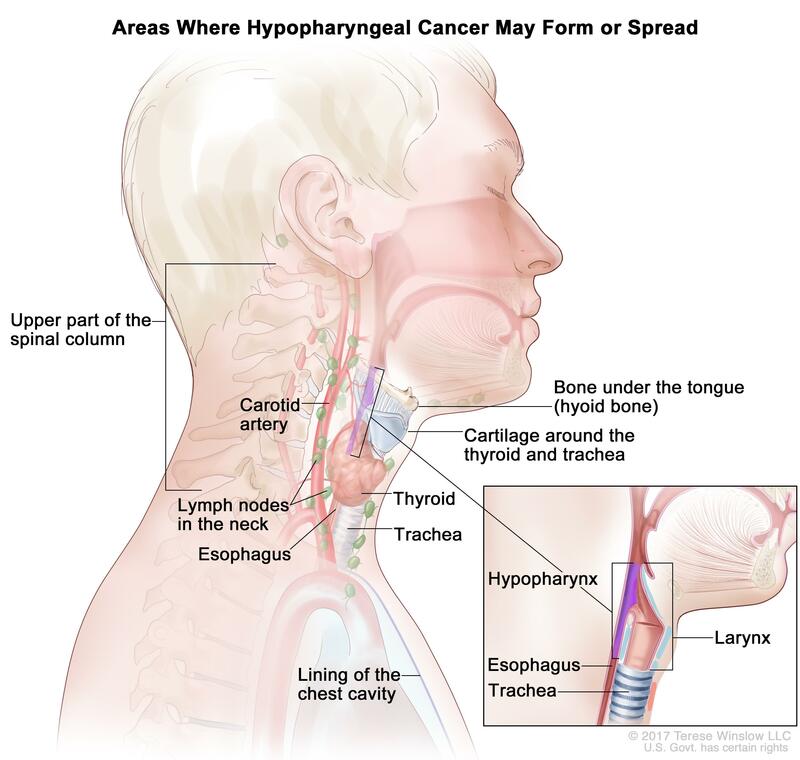 Hypopharyngeal cancer is a disease in which cancer cells form in the tissues or the hypopharynx. The hypopharynx is the bottom part of the throat and is a hollow tube that starts behind the nose, goes down the neck, and ends at the top of the windpipe and the oesophagus. Most hypopharyngeal tumours are squamous cell carcinomas (SCC). There are three standard treatments used; surgery, radiotherapy and chemotherapy. There are no UK-wide statistics. In the USA, an estimated 3000 people will be diagnosed with hypopharyngeal cancer each year. Survivl rates vary based on a variety of factors, particularly stage. The 5-year survival rate is 33%.